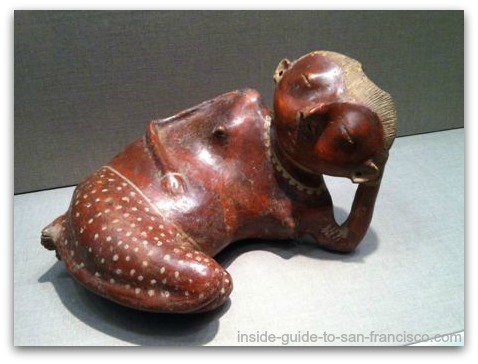 The de Young Museum in San Francisco is a world-class fine arts museum, located in Golden Gate Park. 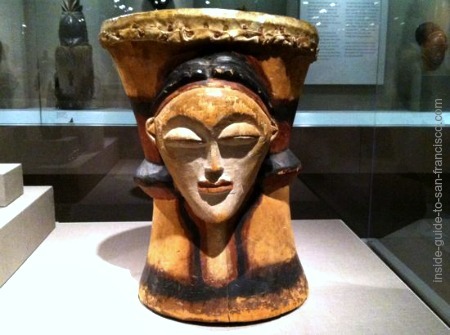 The museum often hosts special, traveling exhibits like King Tut and the Orsay Impressionists, and houses a permanent collection of amazing variety. 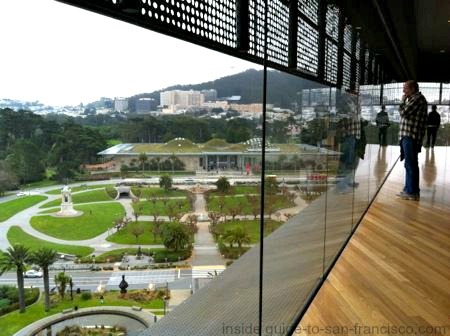 The de Young Museum reopened in its new building in 2005, after being closed for five years; the original Deco-Spanish-style structure at the same location was damaged in the 1989 earthquake. The decision was made to construct a new home for the de Young, instead of trying to shore up the old one. The new building provides an attractive setting inside for its varied collections, but the outside appearance of the museum stirred some controversy (especially the tower...didn't we seen something like this on Tatooine?). 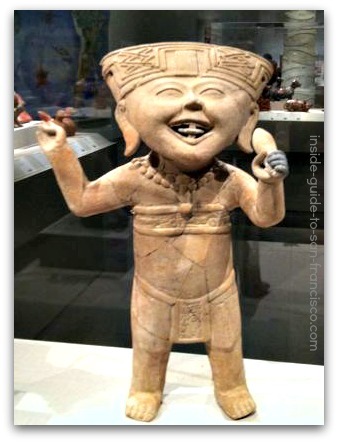 Mesoamerican earthenware figures from 200 BC. 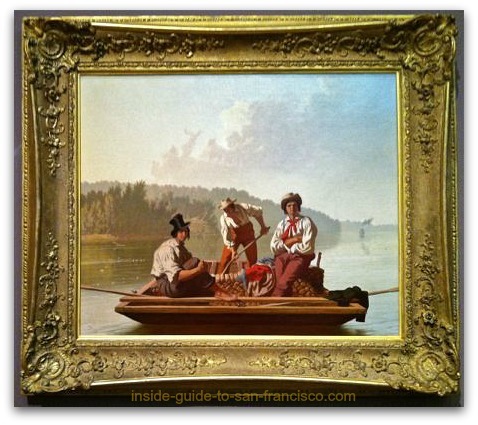 American Paintings, 1650 to the present. 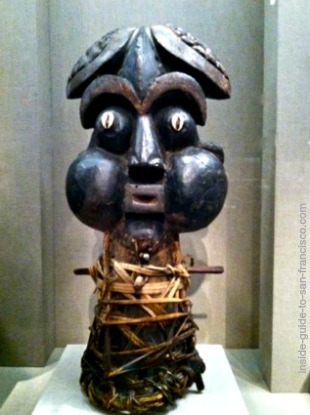 African and Oceanic masks and figurines. 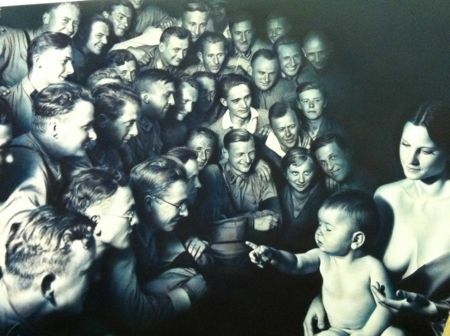 Contemporary Art: painting, photos and sculpture. Sculpture Garden, with Miró and Oldenburg pieces. Medieval European and Asian tapestries. Fashion by Dior, Balenciaga, and Coco Chanel. 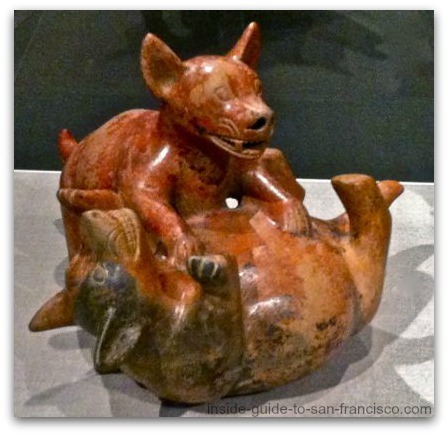 Fascinating Mayan and Mexican ceramics from 200 B.C. until the time of the Spanish conquest. 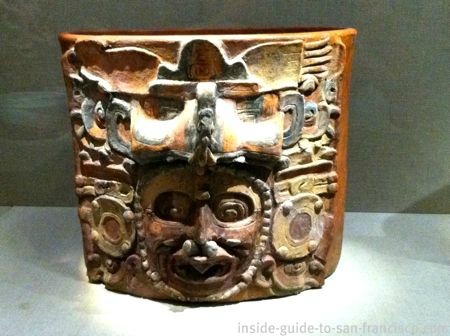 This section also contains a roomful of murals from the Aztec capital of Teotihuacan. 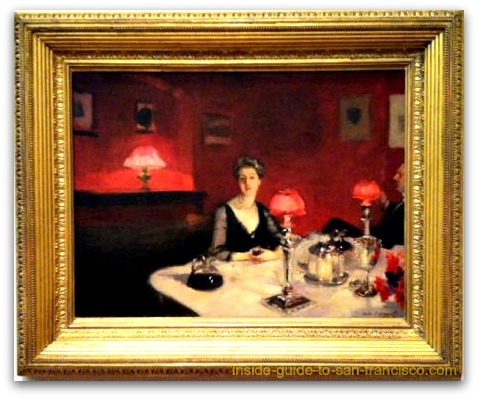 This collection of American paintings and furniture spans the period from colonial times to the early 20th century, including works by Winslow Homer, Paul Revere, Mary Cassatt and Frank Lloyd Wright. 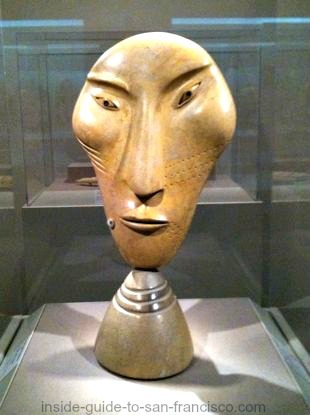 Both traditional and modern works; large collection of Inuit and Eskimo sculptures. American and international modern art, from the early 20th century on, including works by Georgia O'Keeffe, Grant Wood, Diego Rivera, and Willem de Kooning. I think this section is one of the highlights of the museum. 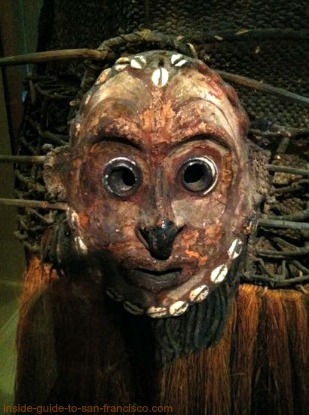 The collection of masks and other figures from Africa and New Guinea is impressive, and is presented in a very striking way. 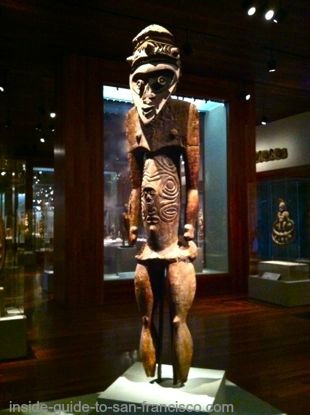 The dramatic lighting in the Oceania Gallery really enhances the eerie, other-worldly feeling. 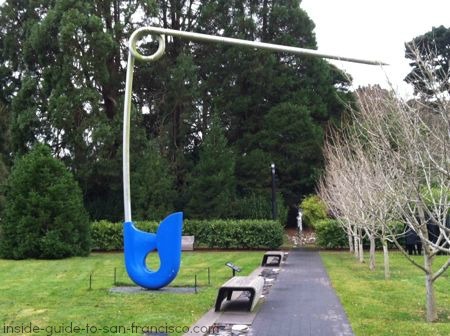 Stroll outside the museum near the cafe and explore works by Joan Miro, Claes Oldenburg and others. 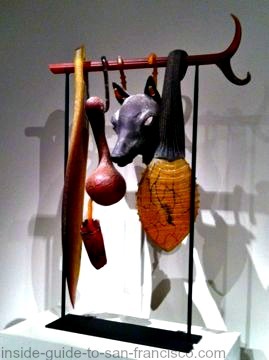 Oldenburg was one of the original Pop Art guys. 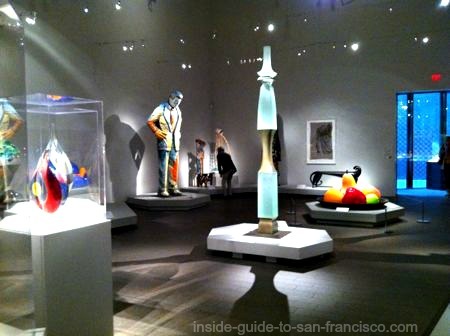 The de Young Museum in San Francisco is one of the limited number of U.S. museums that get the really great exhibits that travel internationally. 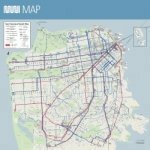 Very convenient for San Franciscans and our visitors! Some are annual events: one of my favorites is the delightful Bouquets to Art exhibit which takes place in March every year. 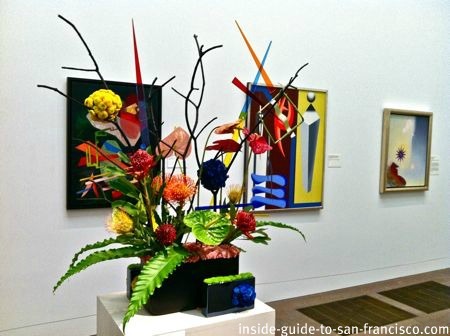 Florists and others artists create beautiful and strange flower arrangements to mirror specific works of art in the museum. 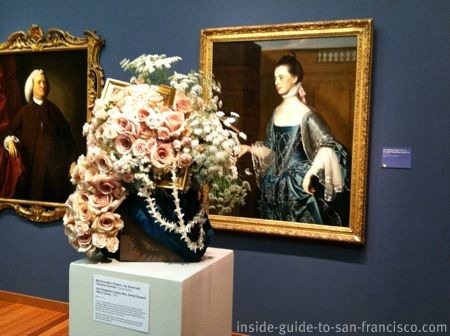 The floral creation is placed next to the piece that inspired it, and there are hundreds of them all through the de Young galleries. 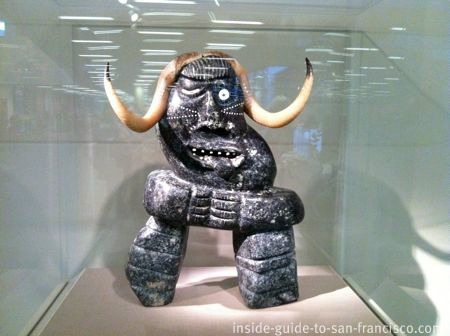 It's a good idea to check the de Young Museum schedule to see what's in town. 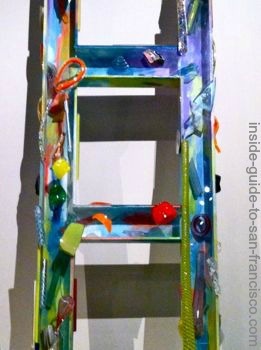 There's always at least one special exhibition happening at the de Young. Museum docent tours are a great deal and really enhance enjoyment of the collections. 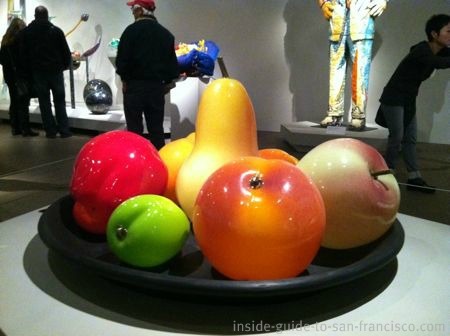 They are free and there are usually around five tours to choose from every day, including "Three Masterpieces in 30 Minutes" and "Highlights of the de Young". There are also a couple of additional tours relating to the special exhibits of the moment. I went on one of the Three Masterpieces in 30 Minutes tours and really enjoyed it. 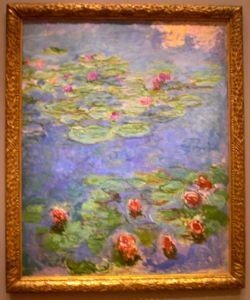 The tours are different each time; it's up to the docent to pick the art works they want to talk about, so it's likely to be something they have some personal enthusiasm about. Check the current docent schedule. There are audio tours available at the front desk that relate to the permanent collection and the special exhibits. In English or Spanish, $8 ($7 for members). There is an observation deck on the top of the tower (the tower that is so loved and hated by the locals). The view is great and it's free to go up there. Closes at 4:30 pm. There is a nice cafe inside the museum with interesting globe lights and great food. Open for espressos and pastries in the morning and lunch starting at 11:00 am. Try their porchetta sandwich with a glass of wine - delicious! Special Exhibitions cost more; typically around $21-25. Admission is free on the first Tuesday of every month. Also, there's a $2 discount if you show your Muni or BART ticket. Buy your ticket through City Sightseeing to save $2. Membership. If you plan to come often, it pays to become a member; admission is then free and includes most of the special exhibitions. And you can bring a guest. Individuals are $119 per year and families $199. 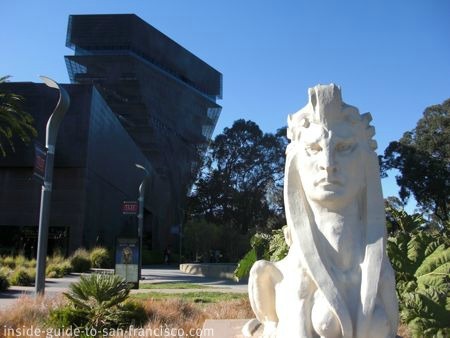 Membership in the de Young includes the Legion of Honor Museum as well. The de Young Museum is located on JFK Drive in Golden Gate Park, next door to the Japanese Tea Garden and across from the Academy of Sciences building. See map below. Parking can usually be found on JFK Drive within reasonable walking distance from the museum. On busy days (sunny weekends and days of very popular special exhibits), parking is trickier. 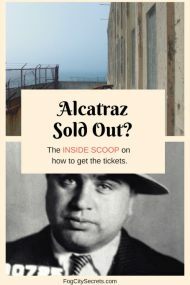 You'll have to park farther away on JFK or MLK Drives, or try the parking spots around Stow Lake nearby. Outside the park is much tougher. As a last resort: there is parking garage under the de Young Museum, a bit expensive ($3.50 to $4.00 per hour), but not terrible for a few hours. There is one entrance on 10th Avenue at Fulton, on the north side of the park, and another just off MLK Drive near the Academy of Sciences. 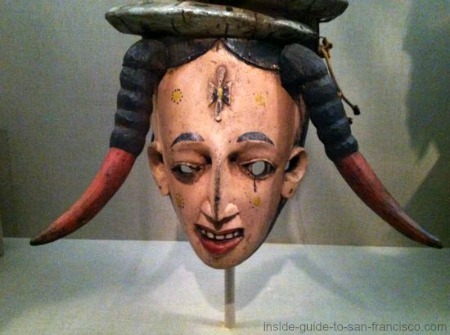 The sister museum for fine arts in San Francisco, the Palace of the Legion of Honor, also has an incredible collection. Look there for Renoir, Monet, Cézanne, van Gogh & Rodin, Andy Warhol, and lots more.